Pioneering cost-cutting technology for the pipeline industry is being hatched by a Norfolk company drawing on half a century of experience in the specialist sector. 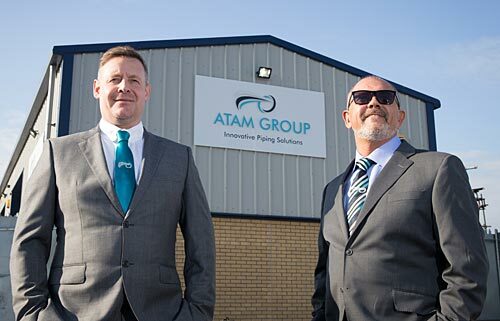 Partners at ATAM Group at Great Yarmouth have created innovative equipment to help inspect wind turbines, and to clean, inspect and dry new piping – along with custom-built ROV technology. Both developments will generate cost savings for the renewable energy and petro-chemical industries. But ATAM says they could also be used on a variety of on and offshore applications from pipelines and processing plants to wind farms across the world. The company is patenting a piping camera inspection system that inspects on its inward journey, then uses air jets to clean away internal debris on the way back – saving the need for a trio of tasks involving camera inspection, hydro washing then drying. The innovative system will be able to work in pipes measuring 140 mm to 500 mm in diameter. ATAM is also developing software which will be engaged on both the Services and Asset Management divisions of the group. It will eliminate the need for carrying paper maps on clients’ sites – replacing it with intrinsically-safe electronic tablets mapping the location of equipment and flanges, showing current certification plus a real-time update of on-going work through Cloud technology. The company, on the Harfeys Industrial Estate, is also working with a ROV manufacturer to provide equipment and solutions for checking and cleaning a variety of structures from ship hulls to tanks and turbine masts. Powerful magnetic ROVs can be attached to the steel structures then driven, using powerful crawler tracks, armed with tooling to meet clients’ specific requirements. “It aims to replace divers and rope access workers which will improve safety in confined spaces and working at height as well reducing cost,” says Loades. The innovations have sprung from the front-line experience of Loades. He and business partner Adrian Durrant have worked on projects all over the globe – from Malaysia and Africa to the North Sea and United States. Loades has learned about the industry from the bottom up, as a technician working on process refinery plants, then an engineering supervisor for projects in Canada, Ukraine and Angola, and a “trouble shooter” turning around a behind-schedule topside contact in Malaysia. He leads on the operational side of the business, which started last September. Durrant specialises in the procedural and office elements, but again from a hands-on background having begun his career as an NDT technician and NDT site lead. He went to be a quality control engineer for a greenfield build in London and a projects manager for various international energy services companies covering Floating Production Storage and Offloading builds, Greenfield construction and Brownfield modification projects. The two worked together at Bacton gas terminal and in Africa and decided to set up their own venture to specialise in innovative piping inspection, ROV technologies, cleanliness services and asset management. “We are looking to put a new twist on traditional process and inspection services – and to provide improved efficiency and cost savings. Our business structure means we can offer a personal service and aim to be an ally and friend to asset owners and construction companies,” adds Loades. They aim to recruit both trainee and experienced personnel for their brand new unit, and are keen to find applications for their innovations in the growing offshore wind industry.